Location: Two miles west of Willetts Point and Fort Totten. 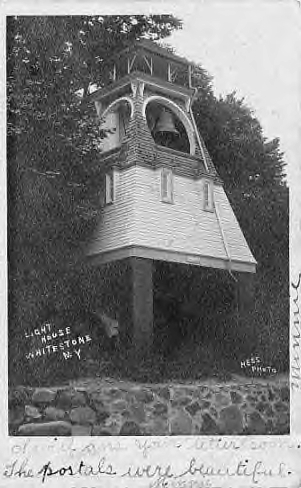 Description: Original structure was a "square pyramidal frame tower on piers; lower part, white; upper wood-color" with a "bell struck by machinery a double blow every 30 sec." Base of structure to center of lantern 20 feet. It had a fixed white lens lantern 36 1/2 feet above water. 1889: Aid shown was built on a small wooded bluff. Sometime after 1908: Original structure is replaced by a black skeleton tower, white tank house on a black base, showing a light 48 feet above the water. Currently: A black skeleton tower, focal plane 56 feet, with a fog bell (one strike every 15 seconds). Similar Lights: There were a few of these small wooden towers in the Third District. Hell Gate (Hallett's oint) was one, and there was one at West Point for some time. Other information: Virtually unknown light with very little available history. This was a minor aid to navigation, not a "lighthouse" as we generally think of them, but it was a part of the area's aids to navigation history. Nearby Willetts Point was home to Civil War veteran and Medal of Honor recipient Abaither J. Knowles.